HS14, 14″ Non-Ferrous saw comes with a powerful 5HP 1PH, 200V (only) or 3PH, 220V or 440V (specify) TEFC motor. 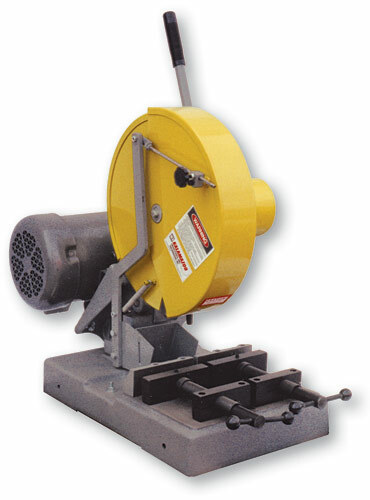 14″ Non-ferrous straight cut saw for cutting ALUMINUM and other non-ferrous materials. 5HP, 3ph 220/440 volt motor. 3450RPM motor, 4400 spindle speed. Cast iron base, trunnion and arm. OSHA safety clamshell wheel guard. Capacities: 4″ square, round and shapes. 3″ solids. Model: HS14-1 5 hp ,1 ph, 220 volt 60 hz. Model: HS14DC 5 hp , 3 ph 220/440 volt 60 hz 1300RPM @ spindle. Optional: metered drip system. (Call for pricing)! 50HZ or 575V 14″ non-ferrous units available also. Call for pricing!